From landscape design, to routine property care our deep expertise and commitment to quality are what makes what we do premier. Adding a warming focal point to your landscape can be a great place for friends and family to gather, even as the weather turns crisp in the fall. 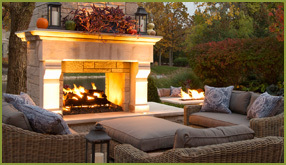 Fireplaces and other fire elements help extend the usefulness of you outdoor living space into the colder months. They also structurally can add a great visual point of interest. Premier Landscape offers landscape design, construction and maintenance services. We service the surrounding areas of: Glen Ellyn, Elmhurst, Naperville, Downers Grove, Clarendon Hills, Burr Ridge, Hinsdale, Oak Brook, Western Springs, La Grange, Palos Park, Winnetka, Highland Park, Wilmette, Evanston, Lake Forest, Northbrook, Northfield, St. Charles, Park Forest, Frankfort, Orland Park and Chicago. Contact Us Today.